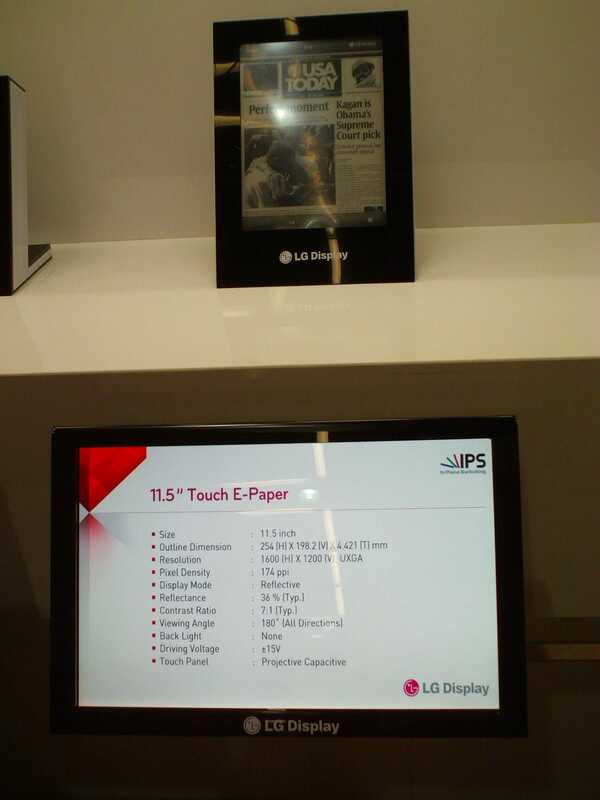 LG was showing of four epaper displays at SID Display Week 2010. There were four different sizes shown 6”, 9.7”, 11.5” and 19”. “GIP” was one new technology they were showing off in both the 6” and 19”. They've combined several existing functions into fewer components allowing them to have only one connector along the top edge of the display panel instead of one of the top and side as done currently. This allows of course for slimming a device made with the new displays and for less side bezel. 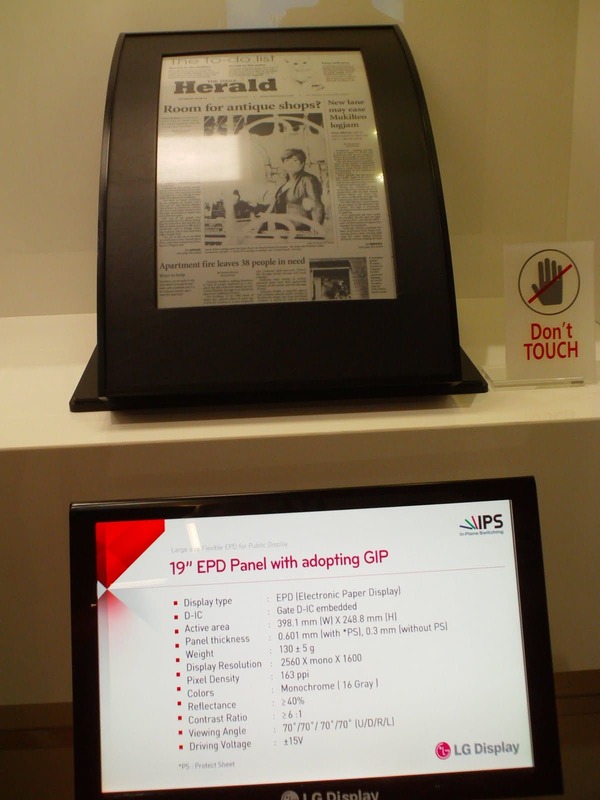 Their metal foil backed flexible displays were on display with the 11.5” and 19”. Flexible devices could be made with these displays but what they really offer is a much more durable device (and slightly thinner) especially with the larger sizes. The 19” displays will go into production next summer but the 11.5” are in production right now! The Skiff reader has this display, so a further announcement about that device cannot be too far away. Also on hand was a 9.7" color display. The color was very good, not over-saturated or washed out looking. They would not discuss the process they were using to add the color, even with some of the Eink people who were impressed when they saw it firsthand. In talking with Eink personnel who worked with LG on the display for SID, I learned that they keep thing s very need to know between different departments working with various partners. 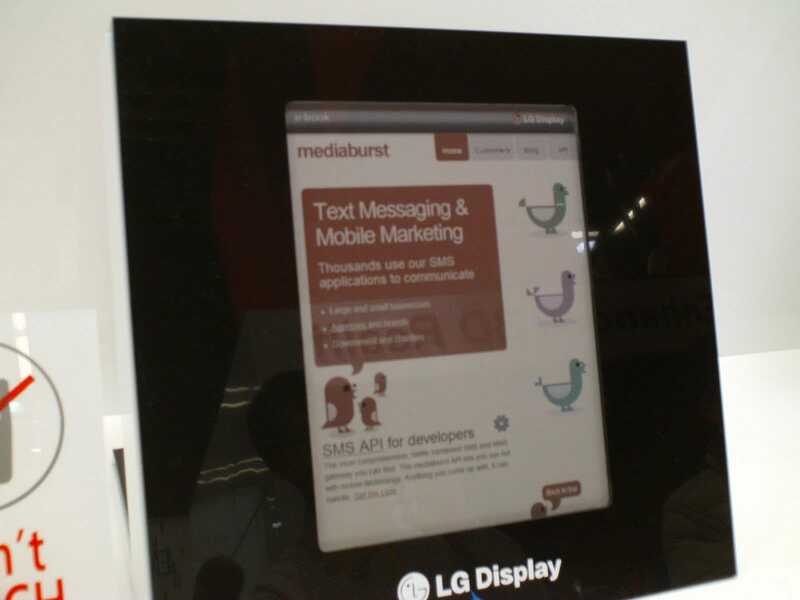 LG says this 9.7 in color display will be in production in the 3rd quarter. A reader could conceivably be on the market by year’s end. At the least, we may see some prototypes and reference models. P.S. In case you're interested, you can view all of the source images from SID Display week here.